Being a full time walleye fisherman on Lake Erie, I learned two things. One, if you want to catch bunches of walleyes, you have to put out bunches of baits. And, two, You better learn to run dipseys and jet divers to get those bunches of baits out. Dipseys are a dream. Fish hit, dipsey trips, reel in fish. No drag. You and fish. Easy. Jet divers. Fish hit, trip board release, fish drags, jet drags also. Two pound fish feels like ten pounder. Fish gets off, you reel in jet, still feels like ten pounder. Why not have a het that releases like a dipsey? Good question. Good answer. We have one!! 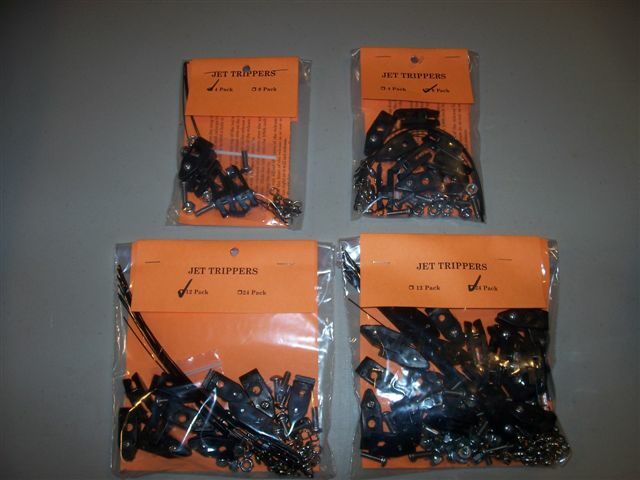 You supply the jet diver, we supply the pieces parts to make your jet release and plane up to the surface. No drag. Easy. Jet Trippers are a modified Clipper Release and a coated cable to change any size jet into a diver that is easy to retrieve. Jet Divers are not included in the kit.